Without a streetcar, we become stagnant. A streetcar can be a transit accelerator for Omaha and an economic engine for the region. A streetcar moves people around an urban core. Connecting neighborhoods, schools, landmarks, cultural centers and more would open up the city for residents, workers and visitors to explore and experience what makes Omaha special. Streetcars create higher density development, which encourages more employers to move back into the area. It allows us to prioritize jobs over parking. Again. Since 1963, downtown parking has grown by 40 percent. But jobs have decreased by 44 percent. Today, the health of our local economy is greatly dependent on millennials and boomers — two generations critical to future growth and community competitiveness given their personal mobility, potential for new household formation and their importance as a vital talent pool for the economy. Goss & Associates. “The Impact of a Walkable, Workable, and Livable Midtown Omaha.” January 2017. A streetcar strengthens our urban core and creates a vibrant community. Defining the heart of our city. A vibrant urban core — with the region’s highest volume of jobs, entertainment and destinations — is critical to the economic health of the entire region. With more people living and working in these areas, we increase our tax base, which benefits everyone in Omaha — north, south, east and west. And no matter where in the city you live, chances are you’ll visit downtown for a concert, event or night out. Wouldn’t it be nice to have all of these places seamlessly connected? Streetcars cannot and should not be built solely for tourism purposes. While a streetcar in Omaha would undeniably benefit tourists, that is not a reason to lay the track. This streetcar is about Omaha, about the people who live and work here and about the impact it will have on our entire community. The streetcar can propel our urban core to the next level. However, tourism will support the streetcar and vice versa. The streetcar will be a coveted amenity to those booking conferences and events in Omaha. It will also connect more than 3,000 hotel rooms along its route, increasing hotel availability and options for large groups and conventions. A streetcar is pivotal in the development of our city. If we continue our current patterns of growth, public costs will outpace our region’s tax revenues by 2050. We can no longer rely on annexation to increase our tax base. And our tax base is crucial in supporting our public schools and aging infrastructure. In other words, we need to grow up and not out. The streetcar allows for more growth by lessening the need for parking and making the way for jobs. Without the streetcar, our urban core will benefit from some level of organic redevelopment and growth. However, potential for growth will be limited to substantially lower density due to current parking ratios and other factors that have impeded growth in recent years. The streetcar can stimulate additional development that makes room for more jobs and more residents — which benefits the entire region. Hitting closer to home, values of houses located near public transportation with high-frequency service (like a streetcar, ahem) performed 42 percent better than those not near the corridor. Streetcars supercharge development because they are on a fixed line. It signals a long-term commitment and increased foot traffic. This economic development benefits the entire city. But cities such as Kansas City and Salt Lake City have shown that this doesn’t and can’t happen overnight. It starts with a spark — a small piece of a bigger picture. With a streetcar, residents, workers and visitors would be able to move freely (without needing a car) through midtown and downtown on transit that is simple to use and is fun to ride. Streetcars provide easier access to office buildings, sporting events, restaurants, concerts, museums, festivals and much more. Ease of movement in downtown is especially important for large events like the U.S. Swim Trials and the College World Series, which rely on fans cycling in and out of seats. When these visitors can move about easily, we can accommodate more of them. Their experience is enhanced and more area businesses will feel the benefits of their presence. The streetcar even benefits those who choose to drive in these areas. With more people riding the streetcar, people can park across a much larger area — reducing congestion and making it much easier to find a parking spot. Because of its fixed route, the streetcar is easy to understand and use. Today’s modern streetcar vehicles are sleek, modern, smooth, quiet, efficient and comfortable — attracting riders who might not normally choose public transit. If you’ve tried the streetcar, you might be more willing to ride the bus, especially in Omaha where ORBT will take you from West Omaha to midtown and downtown, and the streetcar will move you around within the urban core. 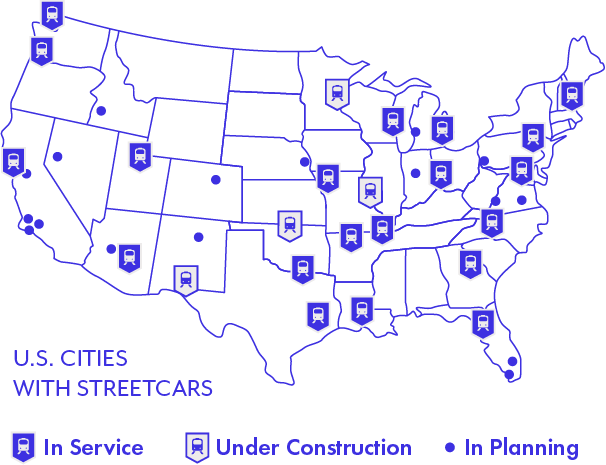 Streetcars connect key activity centers and parking, provide frequent service, have an easily understood route, and use quiet electric vehicles that fit well into an urban setting. They are considered to be pedestrian accelerators, facilitating trips that are part walking, part streetcar. They’re also easy for those with wheels, like wheelchairs, strollers, bikes or walkers, to board and ride, making it a very accessible form of transportation. We’ll tell you a secret: not everyone wants to own a car. Omaha is admittedly a car-centric town. But, more and more people are forgoing the cost of a car and instead relying on public transportation and other modes to get where they want to go. In 1983, 92 percent of people ages 20-24 had a driver’s license. That percentage was 77 percent in 2014, and it continues to drop. A robust and fully integrated regional transit system is emerging in Omaha. Taken together, the proposed streetcar and ORBT represent our region’s first steps toward a more robust system of transit service. Streetcar neighborhoods are walkable neighborhoods. The more people walk, the healthier our communities are. A streetcar increases access to jobs and creates opportunity. Even if you never ride the streetcar, your access is improved. If a streetcar stop is placed a block away from your house, you instantly receive increased mobility. But if that streetcar can take you down the road to a new development — perhaps with a grocery store or a health clinic — you’ve now improved your access. You can do more within your neighborhood than you could before the streetcar was there. Improved access is very important, particularly in many of the neighborhoods in and around our urban core. Unemployment and poverty rates in our inner-city neighborhoods are some of the highest rates in the region. While our region has demonstrated economic resilience through the Great Recession, there are still persistent inequities in our communities of color and low-income residents. Transit should be seen as a service that can reduce poverty by increasing economic efficiency and enhancing opportunities. The modern streetcar can supercharge economic development, which serves the needs of all residents — from the north, south, east and west; young and old; rich and poor — of all backgrounds. The streetcar helps us prioritize jobs over parking. A streetcar reduces the need for so much parking in downtown and midtown, allowing workers to leave their cars behind to make more room for business. Studies show that cities that have relied solely on investments in downtown parking have lost jobs and wages have declined. When we prioritize jobs over parking, we reap major benefits. Creating job opportunities in downtown and the surrounding neighborhoods is essential to the growth and prosperity of our city as a whole. Cities that have invested in transit have gained jobs and have seen wages surge exponentially. The investment made in the streetcar would make our city and its assets more sustainable, would make us less reliant on cars, and would improve mobility and access for residents across Omaha. More parking doesn’t mean more jobs. No matter an individual’s appreciation for their home and community, employment prospects drive many people to relocate to places where more jobs are available. While Omaha is typically regarded as a great place to find a good job, our downtown job market is not what it was 50 years ago and nowhere near what it could be. Past city planning decisions have prioritized parking over jobs. What if it didn’t have to be that way? In 1963, downtown Omaha had 48,482 jobs and 24,794 parking stalls. In 2017, downtown Omaha has 27,342 jobs and 41,063 parking stalls. Currently, just 55 percent of parking is utilized every day in downtown Omaha. All this extra parking is taking up valuable real estate where employers could locate. Imagine if those empty parking stalls could be transformed into businesses, with jobs. If more people are relying on public transportation to get to and from work, that means less demand for parking, fewer cars on the road (a shorter commute for those who do choose to drive) and more room for business growth in the urban core. A streetcar attracts talent and emerging generations prefer it. Today, the health of our local economy is greatly dependent on millennials and boomers — these are the two largest generations and they are critical to future growth and community competitiveness given their personal mobility, disposable income, potential for new household formation and their importance as a vital talent pool for the economy. Omaha is far behind many cities that are rapidly attracting well-educated, millennials — 28 cities to be exact — and a lack of transit likely has an impact on that trend. Studies show that the majority of millennials are willing to move to another city if this means better access to transportation options. The percentage of millenials and boomers who say affordable and convenient transportation alternatives to the car are at least somewhat important when deciding where to live and work is significant. Eighty-one percent of millennials and 77 percent of active boomers say affordable and convenient transportation alternatives to the car are at least somewhat important when deciding where to live and work. According to the Urban Land Institute, consumers of all ages increasingly want to live in walkable, mixed-use, transit-rich communities. A community’s unique appeal drives economic prosperity. However, millennials are particularly important when it comes to the future of cities. Attracting an additional 100 educated millennials per year for the next 10 years to midtown is estimated to increase the overall Omaha metro area population by 7,200 residents and boost Omaha metro area employment by 3,500 workers (Goss & Associates, “The Impact of a Walkable, Workable, and Livable Midtown Omaha,” January 2017). Yes, Gen Xers ride transit, too. A streetcar is a smart investment in our future (with a lot of potential returns). Let’s build on our positive momentum. Streetcars are most successful in areas where the people already are and where development is already happening — areas like midtown and downtown. The proposed streetcar line includes a number of civic and cultural assets and investments in many areas where development is already a priority. Further boosting the positive impact of a streetcar, it will be accessible and inclusive, literally driving more people to these attractions and businesses. Parking does not pay the bills. Thousands of jobs and millions of dollars in wages and salaries that could be going back into our economy each year could be lost if we don’t make room for opportunity. With current parking ratios, Omaha’s urban core can physically accommodate 10,000 new jobs, 3,000 residents and $1 billion in development. If we can reduce the need for so much parking, we have the potential to attract up to 20,000 new jobs, 6,500 residents and $2.2 billion in development. Jump on board with us and be a Modern Streetcar Advocate. Check out the video and podcast below to experience it for yourself. Kansas City’s streetcar has been an overwhelming success. What would a streetcar look like in Omaha?